Can’t go Trick or Treat this year? Not to worry! We’ve got lots of fun way to help celebrate Halloween with your family at home! What Are Family-Friendly Alternatives to Trick or Treating? Ghouls, ghosts, goblins and more, if you’re excited about the upcoming holiday, you’re not alone. An estimated 175 million Americans will celebrate Halloween this year. But not everyone who loves Halloween enjoys trick-or-treating. 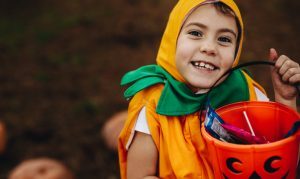 Whether it’s simply not your thing, the weather’s bad, the kids have colds, or you want to kick back and relax this year, then you need some fun alternatives to trick-or-treating with your family. Here are five ways you can celebrate Halloween with your family in the comfort of your own Dallas home. Take miniature pumpkins and have the family decorate them with either watercolors or paints before the holiday. Once they’ve had time to dry, you can hide the pumpkins around the house and then have the kids dress up in their costumes and hunt for them. Plastic pumpkins stuffed with the best treats make for a great alternative as well. Halloween parties are a great way to keep the fun at home and still have a great time. You can keep it in the family or invite neighbors over to join. Decorate the house with colored lights and creepy items, grab costumes, and bring out the games. A Halloween piñata packed full of candy or a few rounds of bobbing for apples always make for a great time (try bobbing for donuts if you want to sweeten things up). Don’t want to have a party? Why not visit a haunted house instead? Depending on the age of those in your family, you can either create one at home for the younger ones or find one in your neighborhood or city. Check out these haunted houses in the Dallas area. You can take the family out for a night full of fright. One of the best experiences of Halloween is that you have a long list of fun fright movies to choose from. So, why choose only one? Grab the family and settle in for back to back classics such as Harry Potter, The Nightmare Before Christmas, Coraline, and many others. Want to make the night more festive? Put on costumes and bring out some tasty Halloween snacks too! Giving out candy can be just as fun as getting it. Have the family dress up and hang out at home, waiting for trick-or-treaters to stop by. You can get to see all the great costumes and make other children smile as you hand out candy through the night. To make it more festive, try throwing in some games, a movie, or even pumpkin decorating to occupy time between visitors. However you choose to celebrate the holiday with your family, remember that you can find more savings for more great times by choosing the cheapest energy rates for your home. While it can be confusing, comparing Dallas electric rates doesn’t have to be. Take advantage of power to choose and visit www.TexasElectricityRatings.com for more information. You’ll find expert tips on how to compare, shop, and switch to the best electricity plan for your household’s needs. Have a happy Halloween!